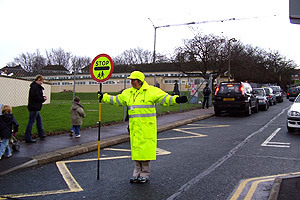 School Crossing Patrol Officers (SCPOs) do a very valuable and rewarding job assisting children and adults to cross the road safely on their way to and from schools. If children and their parents/carers are having difficulties crossing the road near or outside a school the assignment of a SCPO could help. All sites undergo a full safety assessment and analysis to see if they meet the set criteria for the location of a patrol. Contact the Road Safety Team if there is a site where you think a patrol should be stationed and an assessment can then be undertaken. The familiar and reassuring sight of a School Crossing Patrol Officer (SCPO) is, unfortunately, less common than it used to be. Changing work-patterns and lifestyles mean that recruiting patrols is more of a challenge for local authorities these days, not just here in Brighton & Hove, but throughout the country as a whole. Becoming a SCPO is perhaps not as obvious as an employment choice as it once was but it is an excellent part-time employment opportunity that can fit really well around other commitments, for example self-employment or study. Many of our SCPOs have been in post for many years and really enjoy their work. The children, adults and schools that they serve hold them in high esteem and greatly value the fact that they make journeys to and from school safer for everyone. Do you want to become a School Crossing Patrol Officer? There are no special qualifications required to become a SCPO other than a commitment to carry out their duties reliably with care for the children and due regard to other road users. The Road Safety Team ensures that the new recruits are fully trained, and as council employees, receive ongoing support and supervision from a line-manager. Summer and winter uniforms are provided. The starting salary for SCPOs is £8.74 per hour (scale 1/2 spinal point 10). Working hours vary according to location, but typically a SCPO works between 30 and 60 minutes in the morning and in afternoon. If you or anyone you know might be interested in working as a School Crossing Patrol Officer, contact the Road Safety Team for more information and/or an informal chat.